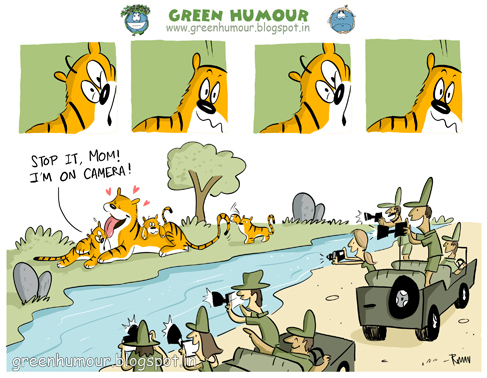 Green Humour: Happy Mothers' Day! Tiger mothers are extremely dedicated and fiercely protective of their young. With no other contribution fro her partner except his sperm, the tigress has to hunt for herself even during pregnancy. Although tigers are known to be solitary animals, the bonding between tiger moms and cubs is nothing short of extraordinary. Gestures, calls, licking, playfights- all form an tintegral part of the mother-cub bond. Mortality among cubs is very high and maternal care is crucial to the survival of tigers. And yes, A3 size posters available on orders as usual. Mail me mentioning the number of copies and your postal address.